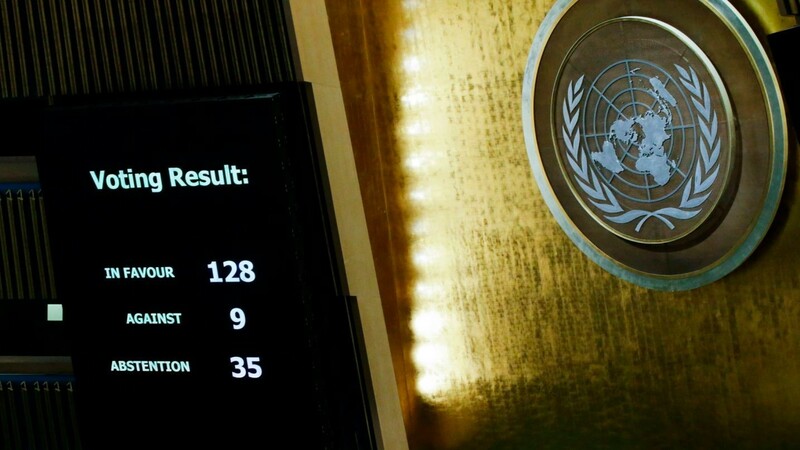 December 21, 2017 — Today, in an emergency session, the overwhelming majority of the world’s nations at the UN General Assembly voted 128-9 in favor of a resolution calling on the United States to overturn its decision to recognize Jerusalem as Israel’s capital. This “collective act of defiance” took place despite threats from Trump’s ambassador to the UN, Nikki Haley, to “take names” of countries voting against the United States and Israel, and threats by Trump to cut US aid to those countries. The resounding failure by Israel and the US administration to thwart the pro-Palestinian vote at the UN General Assembly follows a similarly embarrassing UN Security Council vote on Monday which also rejected the US-Israeli position 14-1. This vote is further proof that the far-right Israeli-Trump alliance is more isolated than ever as the overwhelming majority of nations are finally recognizing its fatal attempt to undermine both Palestinian rights and the very rule of international law. Holding Israel accountable for its egregious, decades-old human rights violations is crucial to upholding both. To defend the UN against this thuggery by Israel and the Trump administration, the BDS movement calls for meaningful sanctions, especially a military embargo and intensified boycott and divestment measures against Israel’s regime of oppression. BDS today is not only crucial for realizing Palestinian freedom, justice and equality. It is also critical to stopping Trump, Netanyahu and other leaders of the international far-right who are threatening world peace and global justice like never before. All European states, with a few exceptions that abstained, voted in favor of the Palestinian position on occupied Jerusalem, and so did Japan, China, India, Nigeria, Brazil, Korea, Russia, and South Africa, among many others. Favoring concrete sanctions to merely symbolic gestures of solidarity with the Palestinian liberation struggle, South Africa’s ruling African National Congress (ANC) at its general conference yesterday unanimously adopted downgrading diplomatic ties with Israel. "[It] sends a clear message to Israel that there is a price to pay for its human rights abuses and violations of international law," the ANC said in a statement. The Palestinian BDS National Committee (BNC) is the largest coalition in Palestinian civil society. It leads and supports the global Boycott, Divestment and Sanctions movement for Palestinian rights. Visit our website and follow us on Facebook and Twitter @BDSmovement.